The Maryland Senate has advanced a bill that would ban the use of the foam products by restaurants and grocery stores to a final vote Monday. The Democratic-controlled chamber acted Thursday after accepting an amendment that would delay implementation of the ban for six months. The amended bill would ban businesses that sell food from using “expanded polystyrene food service products” — sometimes referred to as Styrofoam — starting July 1, 2020, instead of January. County governments would be responsible for enforcing the ban and could impose fines of up to $250 per violation, after first giving a written warning. The legislation is sponsored by Sen. Cheryl Kagan, a Montgomery County Democrat. A similar bill is pending in the House of Delegates. The legislation is a priority of House and Senate Democrats in Maryland, meaning it is likely to pass. If the bills become law, Maryland would be the first state with a statewide ban. ANNAPOLIS — Maryland could be the first state to ban foam food containers statewide, but it would mean taking legislation where it’s never gone before. For the third straight year, the Senate Education, Health and Environmental Affairs Committee held a hearing on a bill that would ban the use of foam food containers. Sen. Cheryl Kagan (D-Montgomery) is again sponsoring the bill, SB 285, to create a unified ban of the product. “It takes up room in our landfill, it breaks down and does not biodegrade, it ends up littering the side of our streets, it ends up in our waterways, the fish eat it and then we eat the fish. Single-use foam [containers] are up to 40 percent of the volume of our litter,” Kagan said at the bill hearing on Tuesday. Food service businesses would have until Jan. 1, 2020, to transition to non-foam containers, though a one-year waiver may be available to businesses that would experience “undue hardship” from the ban. More than half of the state’s population lives in a county or city that has implemented, or has pending, restrictions on foam packaging in food service, she said. The bill would ban plastic foam food containers — often referred to as Styrofoam, which is a trademark name often misused to describe disposable containers that carry food from restaurants, fast-food places, cafes, delicatessens, coffee shops, supermarkets, food trucks, institutional cafeterias and others. The Tasting Room in downtown Frederick uses plastic containers for the majority of its food, if it’s being carried out of the restaurant. However, the one item it does put into a foam container is soup, said General Manager David Campbell. The soup is made from scratch in the restaurant each day, and it is packaged to order in the kitchen. A loophole in the bill allows pre-packaged soup and other foods sealed in plastic foam outside the state to be exempt from the ban. The Tasting Room would not qualify for this exception. The restaurant has not looked into any alternative containers, but it would have to if the bill progressed through the General Assembly, Campbell said. Similar bills submitted in both chambers in 2017 and 2018 never made it out of committee. Still there has been movement in Maryland and Washington, D.C., away from plastic foam products. Montgomery County banned plastic foam in food service and as loose packaging starting in January 2016. The following July, Prince George’s County followed suit, banning plastic foam for the same uses. Washington, D.C., also banned plastic foam food containers in 2016 and recently began enforcing a ban on single-use plastic straws at local eateries. These changes have largely been directed at the food industry, even though foam products are used and sold in other industries. “I don’t know if it’s needed in the food industry as much as it’s needed [to be recognized] as a global issue polluting our landfills,” Campbell said. Kagan’s bill proposes that the ban would be overseen by the Maryland Department of the Environment but enforced locally by each county. The counties would each set a fine of no more than $250 and be in charge of enforcing the ban through its health department. Frederick County Sen. Ron Young (D) is a co-sponsor of the ban. One of the reasons the food industry may be targeted to be the first to stop using a product is because it is the largest user of these single-use products, Campbell said. But he declined to speculate on why lawmakers were considering a ban on plastic foam now. Baltimore City will stop the use of plastic foam food service products in its school’s cafeterias in October. The bill would expand on this action by also banning the use of plastic foam trays in all schools and higher education institutions statewide. Frederick County Public Schools currently buys five-compartment foam trays to serve food in the majority of its cafeterias, said Steve O’Brey, procurement coordinator for the school system’s Office of Food and Nutrition Services. He has begun looking at alternative products; however, initial estimates show a $50,000 annual increase in cost. FCPS is trying to be proactive in finding a new product to replace its foam trays, since it appears a ban on plastic foam products is the direction the state is headed, O’Brey said. “We know it’s probably going to come down the pipe in the next few years,” O’Brey said. There are a few paths that FCPS could take to replace its foam trays. Approximately 90 percent of the county’s elementary schools and four middle schools currently have reusable plastic trays, but not all the schools have a dishwashing machine to accommodate this change and other school systems have struggled with high school students throwing reusable trays in the trash, said Robert Kelly, senior manager of food and nutrition services at FCPS. “Who’s going to be pulling those out of the trash?” Kelly asked hypothetically. Another possible alternative to foam trays is a compostable paper tray, which FCPS successfully piloted in Middletown High School during the 2018-2019 school year. However, the tray is three times the cost of the foam tray and would be cost-prohibitive to put in the 10 other high school cafeterias, Kelly said. FCPS’s overall food service operating budget is $12.9 million, and the $50,000 increase to change the trays would account for less than half of 1 percent of the total budget. Kelly cautioned, however, that the $12.9 million included much more than just food. FCPS is self-sustaining and its food service budget includes labor and benefits for its 340 employees as well as equipment, repairs, computers, pens and pencils on top of food. On average, FCPS serves 7,000 breakfasts and 13,000 lunches daily at its schools. “Compared to the $12.9 [million], it’s a small number, but there’s a lot of other numbers that factor into this,” Kelly said. A state bill would allow the Montgomery County Council to change the way residents vote in local elections. BETHESDA, MD — A bill that could change the way Montgomery County residents vote in local elections is being considered in the Maryland legislature. Proposed by Del. 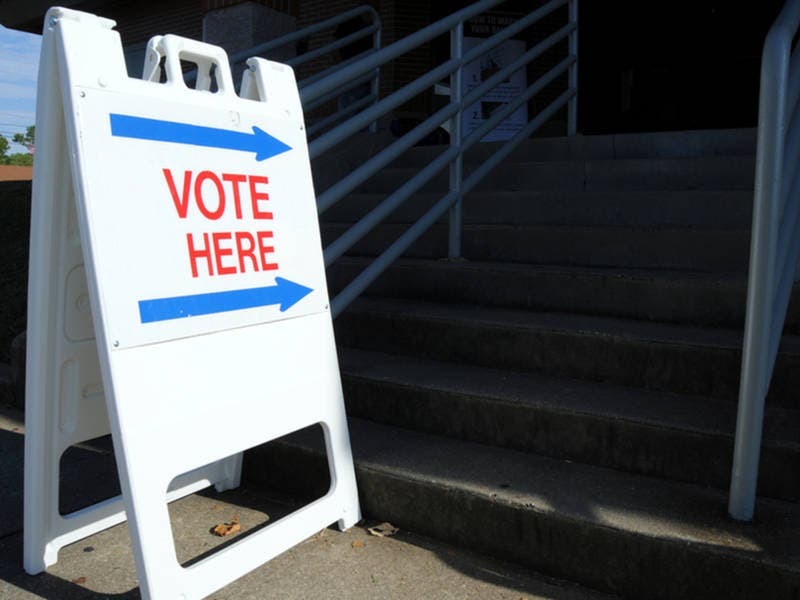 Eric Luedtke and Sen. Cheryl Kagan (D-Montgomery), the bill would allow the Montgomery County Council to adopt a ranked-choice voting or an approval voting system. Under a ranked-choice voting system, voters rank candidates for office in order of preference. The candidate with the majority of first-preference votes wins. If no one receives the majority, at first, election officials will tally voters’ subsequent choices until there is a winner. In an approval voting system, voters can choose any number of candidates. The candidate most chosen wins the election. The Montgomery County delegation voted unanimously in support of the bill on Friday. The proposal will go before the House Ways and Means Committee on Feb. 19. Kagan said that the bill had been introduced to the delegation last year, but only passed by a narrow margin. “Sometimes it takes another year or two for legislators to feel comfortable with a new issue,” Kagan told Patch. Basalt, Colorado: Adopted in 2002 and will be used when three or more candidates run for mayor. Kagan said that the traditional voting method makes it impossible for voters to express how they feel about each candidate. Kagan said that it wouldn’t be difficult for residents to adjust to a new voting system. “Voters make decisions every day and are faced with a series of choices, whether it’s about which flavored ice cream they ordered, or what kind of beer is available on tap, or what outfit to choose in the morning,” Kagan said. A bill that would give the Montgomery County Council the authority to change its voting system to an alternative “ranked choice” method has cleared its first hurdle in the Maryland legislature. The bill, sponsored by Montgomery Democrats Sen. Cheryl Kagan (Rockville/Gaithersburg) and Del. Eric Luedtke (Burtonsville), would allow the county to transition local elections to a method where voters mark their ballot by ranking the candidates in order of preference. The proposal was advanced to the Ways and Means Committee for a hearing Feb. 19 following unanimous approval by the Montgomery County legislative delegation on Friday. Kagan said that the bill had been introduced last year, but only passed narrowly in the delegation. The unanimous support this year, she said, was due to the fact that legislators heard complaints from confused voters who last year faced a choice of 33 candidates in the Democratic primary in the at-large County Council race and six in the county executive race. “It was overwhelming to most voters, and people wanted more options in their ability to show nuance with their ballots,” she said. Under the ranked choice system, currently used in five states, the candidate with more than 50 percent of “first choice” votes wins. If no candidate receives a majority, the “second choice” votes are tallied, and the process repeats until a candidate receives a majority of votes. During Friday’s delegation session, the bill was amended to require a public education campaign if the legislation is approved by the House of Delegates and Senate. Kagan said she doesn’t believe the new method is too hard to learn, equating it with choosing an alternative type of pie for dessert. “You go to grandma’s house for Thanksgiving, and she didn’t make the pecan pie, but the apple pie is really good, and the blueberry pie is good too… we do that all the time. In the same way people do that with their candidates. So I don’t think this is going to be foreign,” she said. Gov. Larry Hogan held a press conference Thursday, pushing back against Maryland Senate Democrats, who started a debate on overturning the mandate that requires schools to begin the academic year after Labor Day. In 2017, Hogan’s executive order to start Maryland public schools after Labor Day went into effect. Since then, Montgomery County Board of Education has fought the mandate. According to Patricia O’Neill, the vice president of the school board, when Hogan signed the executive order, he required schools to end by June 15. The state Senate has already begun debate about introducing legislation that would overturn Governor Hogan’s mandate. Nancy King, who represents Montgomery County, is one of the sponsors of the bill. According to Cheryl Kagan, the legislation will have its final vote in Maryland’s Senate on Tuesday. O’Neill said that the school board supports this legislation. In his press conference, Hogan cited Democratic politicians who he said previously supported the mandate to start school after labor day. Hogan argued starting school after labor day is popular with Marylanders and its only politicians and “paid political operatives” who want to overturn the mandate. “We simply cannot and we will not allow misguided and misinformed legislators and special interest groups to turn back the clock and ignore the people of Maryland,” said Hogan. O’Neill questioned the credibility of a survey that Hogan cites about Marylanders support for the mandate. She said that she understands local businesses want more business Labor Day weekend, but she said that academics need to come first. Hogan said the legislation to overturn the post-Labor Day school year start passes, he’d bring forth legislation that would bring the decisions back to Marylanders to make the decision, by putting the issue forward as a referendum. “Any local school system that attempts to evade the law and start school before labor day would be required to put that decision on the ballot, for the voters of that jurisdiction to decide for themselves. Our bill will offer genuine local control over this important issue, as opposed to the legislation currently before the Senate masquerading under the guise of more local control, which would actually do the opposite of what local citizens want and instead empower a bunch of bureaucrats and administrators decide,” said Hogan. A former assistant state’s attorney and executive director of the county revenue authority, Alsobrooks became the first woman elected Prince George’s State’s Attorney in 2010 and re-elected the next term. During her eight years in office, violent crime fell in the county by 50 percent. The Democrat decided to run for Prince George’s County Executive in 2018 after noticing many of the issues she saw in courtrooms could be prevented through proactive public policy. Running unopposed in the general election, Alsobrooks became the first woman elected to the top county position. Sworn into office in December, Alsobrooks notes “that I have, I think, an additional obligation to make sure that I do an amazing job as county executive so there will never, ever be a question again about a person’s gender. “It’s not so important to be the first at something but make sure you are not the last. You have to do such an exceptional job that it creates opportunities for women to come behind you and to also have that same chance again based on your performance and competency,” she said. Women made historic gains in the 2018 election. Nationally, a record 120 women were elected to the U.S. Congress with 39 of them freshmen. 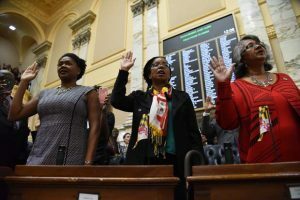 Maryland sent its largest class of women to the General Assembly this month. Local and county races also saw wins for women. Goucher College’s Director of the Sarah T. Hughes Field Politics Center Dr. Mileah Kromer notes many women, mostly Democrats, decided to run as a pushback to the 2016 presidential election and controversial Donald Trump administration. “The highest and hardest glass ceiling was cracked but not shattered (when Hillary Clinton lost.) … It is the intersection of both party and gender that drove” women to run. Political science research has suggested over the years that women, more so than men, need to be encouraged (sometimes multiple times) by party leaders or influencers to run for office at any political level. Kromer has noticed with this past election cycle, more women are becoming self-starters by running without the nudges. “That is slightly different than what we have seen in the past,” she said. A September Pew Research Center study found people tend to see women as being more empathetic and compassionate than men. Women are also better at working out compromises as well as standing up for what they believe in. “There has been a push to elect those types of elected officials particularly at a time where our trust in government is diminished overall, and so I think electing female candidates can potentially be an avenue to increase trust in government,” Kromer said. In December, Sen. Sarah Elfreth (D-District 30) was one of 60 new legislators participating in orientation at the State House in Annapolis. She attended briefings on ethics and budgets along with pointers on drafting a bill. The most interesting moment for her came on the first day when Senate President Thomas V. Mike Miller Jr. and House Speaker Michael Busch spoke to the group about the history of the 1772 building. George Washington resigned his commission to Congress as commander of the Army there. Thomas Jefferson used the second-floor offices as his office when he was ambassador to France. With a focus on protecting the Chesapeake Bay, better education and affordable health care and childcare, Elfreth will be on the budget and taxation committee. 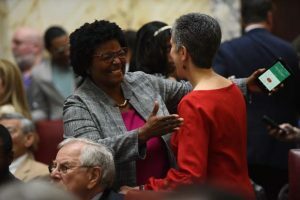 Previously on the advocacy side working for Johns Hopkins and the National Aquarium, she decided to run when Sen. John Astle announced his retirement. She was a part of the first class of Emerge Maryland, a nonprofit designed to help recruit and train Democratic women from diverse backgrounds to run for office. Elfreth has enjoyed the camaraderie developed between women across the state running for different positions. “It is a group we can all turn to,” she said. Martha McKenna, Emerge’s board chair, believes women ran in record numbers because many had been preparing to run for office for several years. Emerge recently picked its seventh class of around 20 women who will graduate in May. Seventeen of their graduates now hold public office. When looking back at the 2018 election, McKenna is hopeful for the future of Maryland. With a political career in both the House and Senate, Kagan noted mentors and coaches are invaluable and she has reached out to help freshmen legislatures. “The legislature is a complex process and it is easy for a freshman to have early missteps so I think we should all be looking out for each other and helping every legislator to success especially the women,” Kagan said. Howard County Council councilwomen Christiana Mercer Rigby was a part of Emerge’s 2017 class. Working in the government and nonprofit sectors as well as being a community organizer, she wanted to run as a way to have a broader impact. Emerge helped her to prepare and run a successful campaign including personally knocking on more than 10,000 doors in her district. “I feel like I have an amazing to do list from all of the doors I knocked on,” she said. Three of the five members of the council are women — up from two with Rigby the youngest woman to ever chair. Just a few weeks after the board’s swearing in, the council decided to move its monthly meetings from 8:30 a.m. to 10 a.m. to allow parents the opportunity to get their kids on the school bus. “We are really trying to create a system that is supportive of working parents,” Rigby said, noting herself and two other members have young children while the other two members were supportive of the change. The Carroll County Courthouse was built in 1838, and yet a woman had never been appointed or elected as a circuit court judge. Attorney Maria Oesterreicher figured she could continue to apply when there was a vacancy or run against sitting judge Richard Titus. “I mulled it over for quite a long time,” she said. Deciding to run, she heard from voters who didn’t care that she was a woman and were deciding to vote for her based on her qualifications. Upon winning, she also heard from people she didn’t know about how happy they were that a woman would finally be presiding in the county’s circuit court. One woman brought her 12-year-old daughter to Oesterreicher’s investiture, noting it was important for her daughter to see women that have fought to get the position they hold. ANNAPOLIS, Md. — A better way to handle emergencies may be on its way to Maryland. Lawmakers are looking at a statewide upgrade of the 911 system, which they sayneeds speed, reliability and security. “Maryland’s 911 is behind 22 other states in updating our system to become Next Generation 911,” said State Sen. Cheryl Kagan who headed the commission to advance 911. There are 23 recommendations including technology to locate people faster, accept texts and photos, enhance cyber-security and address staffing shortfalls. State Sen. Cheryl Kagan chaired the commission. “People talk about how they can push a button on their phone and the pizza person can find them, or Lyft and Uber can find them, and yet 911 can’t,” She said. It won’t be cheap. The overhaul is in the $40 million range with an annual cost between $5 and $10 million. Part of the cost would be paid by adding 25 cents to dollar-amount charged for 911 on our telephone bills, which supporters say is worth the service. Lawmakers in Annapolis on Thursday had their first opportunity to be formally briefed and to ask questions about the major education policy and funding report recently finalized by the Kirwan Commission, a state education commission chaired by William Kirwan. The commission’s ambitious report calls for $3.8 billion a year in added funding to support recommendations that touch on everything from teacher salaries to early childhood education in what Kirwan called “a carefully quilted package of initiatives” on Thursday. The report makes extensive policy recommendations and total funding recommendations determined over the course of two years, but the report does not include recommendations for how the cost would be split between local districts and the state. Some of the initial concerns voiced Thursday by senators in the joint Education, Health and Environmental Affairs Committee and the Budget and Taxes Committee meeting included those they are hearing from their local school systems: fears the recommendations would become unfunded mandates, questions about the impact of the recommendations on more rural areas of the state, and most of all, questions about how much of the cost burden would fall on individual school systems. A small working group is to meet this summer to suggest a division of cost between local districts and the state. Those recommendations will be presented to the full Kirwan Commission, and then presented to legislators in the fall. With budget season ramping up in local districts, Frederick County Public Schools staff continue to estimate county and state funding without any details about the amount of money they can expect to receive as a result of the Kirwan Commission’s report or the mandates they may need to fulfill using their existing funding. One of the recommendations that could be challenging for more rural parts of the state to meet, according to Sen. Jack Bailey (R-District 29), is the mandate to offer free, quality prekindergarten to all 4-year-olds and preschool for 3-year-olds from low-income families. Another concern came from the commission’s aim to encourage higher education institutions overseeing teacher preparation programs to raise their standards. Sen. Melony Griffith (D-District 25) asked Kirwan if this recommendation considered the implications for community colleges, including the added costs it could represent. Sen. Cheryl Kagan (D-District 17) asked about the commission’s recommendations for English Language Learners, a student population that has grown quickly in Frederick County and one Kagan called a “hugely important aspect of our population.” While the commission report calls for more money to support these students, Kirwan said this addition isn’t included in their initial fiscal 2020 plan due to limited funding. Though the commission’s work was set to be completed by the start of the current legislative session, Kirwan said there are benefits to the delay. The commission’s work is now set to be completed by the next legislative session in fall 2019. RANKED-CHOICE voting, which allows voters to list candidates in order of preference rather than vote for just one, has seen a surge in use in recent years. Last year, the number of jurisdictions acting to adopt this form of voting more than doubled as officials came to recognize its advantages in better reflecting the will of voters. Maryland and Virginia now have a chance to join the movement, with legislation pending in both states. Legislation in Virginia would permit localities to move to ranked-choice voting, also known as instant-runoff voting, in elections for boards of supervisors and city councils. In Maryland, bills have been introduced that would allow Montgomery County and Baltimore to use ranked-choice voting in elections for county and city offices. Similar legislation failed in previous legislative sessions in both states, but supporters think there may be a better chance this year because of the increased interest that resulted from last year’s midterm elections. Maine used the method in its senate and congressional races, a national first that attracted widespread attention. Just as impactful is the negative example provided by the experience in Montgomery County, where crowded fields in the Democratic primary for county executive and County Council allowed candidates to win with a very small percentage of the vote. Under ranked-choice voting, a candidate must garner more than 50 percent of the vote and the winner is decided in an instant runoff that eliminates candidates based on votes they tallied as the second, third or even fourth choice of voters. Sen. Adam P. Ebbin (D-Alexandria), a sponsor of the Virginia bill, said ranked-choice voting is the antidote to “strategic voting,” whereby voters skip over candidates whom they might favor because they don’t think they have a chance of winning. Sen. Cheryl C. Kagan (D-Montgomery), one of the sponsors of Maryland’s legislation, said ranked-choice voting is “simple and intuitive,” likening it to other decisions people make every day when their first choice is unavailable. The pending bills do not mandate a switch to ranked-choice voting but allow the localities to decide. We urge Maryland and Virginia lawmakers to allow this to happen. Alarms are sounding in Annapolis regarding Maryland’s antiquated 911 system. The system is 50 years old, and upgrading it could cost as much as $50 million, but the fix would allow callers to send photos, videos and text to 911 operators. Like landline phones, Maryland’s current 911 system is based on 1970s technology. A bill package under consideration in the General Assembly would enable jurisdictions across the state to upgrade systems all at the same time. “If you call today, it would be the same as calling back in 1973,” said Steve Souder, a 911 expert in Fairfax County, Virginia. The outdated technology gets overloaded, and it can’t reliably locate the emergency. Callers can only communicate by talking directly to the dispatcher. “This (cellphones) is what it’s all about. This is the problem that we are working to overcome. We need to find individuals; they are on the move. They want to use this device and communicate with 911 with this device,” said Richard Brooks, chief of the Cecil County Department of Emergency Services. “The device I have in my hand, I can press a button and I can hail a car, I can order a pizza. I don’t have to talk to anyone. I don’t have to tell them where I am. Not so with 911,” said Kevin Kinnally, a policy associate with the Maryland Association of Counties. A commission studying 911 systems across the state issued a 65-page report in December with 23 recommendations. “Once we update our technology, in addition to making phone calls, people will be able to send photos, videos and text to 911,” said Montgomery County Sen. Cheryl Kagan, chair of the NextGen 911 Commission. The next generation 911 systems are broadband and are cyber secure. Upgrades would be tailored to each locality, and the systems will be interconnected to a neighboring jurisdiction, so fewer calls would have to be rerouted. Staffing levels also need to be addressed as there is currently a 13 percent vacancy rate. “(There’s) no time to spare,” said Bill Ferretti, communications director for Montgomery County police. Paying for the new system is a work in progress. Recommendations include increasing the 911 surcharge fee per phone and seek an increase in state funding. Marylanders’ phone fees could increase to pay for major upgrades to the state’s 911 system under a proposal before the General Assembly. The measure would increase the monthly surcharge on residents’ phone bills from $1 to $1.25. In addition, each phone line on a family plan would be charged the fee. Currently, people only pay one fee per bill. Revenue from a fee hike would help the state transition to Next Generation 911, an internet-based system that would improve location accuracy and eventually let callers send video and other multimedia messages to call centers. “We are still dealing with technology that’s 50 years old,’’ Sen. Cheryl Kagan said Wednesday at a news conference in Annapolis with supporters of her proposal. Maryland last raised its 911 phone fee in 2003. The state is the only one in the country that charges one fee per bill rather than one fee per device, said Kevin Kinnally, associate director of the Maryland Association of Counties. “This would bring us in line with every other state,” Kinnally said. Kagan, a Montgomery County Democrat, chaired a state commission that studied how to advance Next Generation 911 across Maryland. The state’s Emergency Number Systems Board has called for all the state’s 24 call centers to switch to the new system by the end of 2021. That will be costly. Officials on Wednesday estimated the initial price tag of the modernization could top $40 million. In addition, recurring costs could total roughly $10 million to $15 million annually, said Walt Kaplan of Mission Critical Partners, a consulting firm hired by the state. Many states have turned to 911 fee hikes to help pay for the shift to Next Generation, said Brian Fontes, CEO of the National Emergency Number Association. A major goal of Next Generation 911 technology is to improve first responders’ ability to locate people who call for help. It could also let people send texts and videos to 911 if they are in situations where it would be dangerous to make a phone call. With a cellphone, “I can press a button and I can hail a car, I can order a pizza,” Kinnally said. Last year, the state said it was taking steps to let people text 911 across the state. Officials said Wednesday that the service is not yet available except in Frederick County. A spokesman for the state Department of Public Safety and Correctional Services said up to seven additional counties should be able to offer the service by the end of February. Kagan plans to introduce several bills to address recommendations of the commission. One would touch on the training and retention of 911 employees. Statewide, 13 percent of 911 specialist positions are vacant, she said. Another bill would restrict access to certain 911 records under the Public Information Act. Kagan said it’s meant to protect victims’ privacy. Last year, the Maryland, Delaware, D.C. Press Association, of which The Baltimore Sun is a member, opposed a similar bill by Kagan because it was too broad, executive director Rebecca Snyder said. Snyder said the association is satisfied with the “narrow scope” of this year’s bill, which would shield medical information, as well as the personal information of victims of domestic violence and sexual assault. But the organization opposes a provision that would restrict the public release of “gory or gruesome” images because state law already gives officials discretion to deny access to such images, Snyder said. ANNAPOLIS, Md. (AP) — Maryland supporters of updating 911 emergency call technology are outlining some proposals. Sen. Cheryl Kagan is holding a news conference Wednesday with supporters. One proposal would enhance Geographic Information Systems capacity to help first responders locate those in need more quickly and accurately. Supporters of upgrading the system also are calling for updates in technology so responders could receive texts, photos and video. Legislation approve last year in Maryland creates a commission chaired by Kagan to study 911 concerns. The commission has issued a 65-page report with 23 recommendations to improve the state’s emergency call system. ANNAPOLIS, Md. – Some of the first numbers that children learn in case of an emergency are 911. “Already, I got this many signatures from Democrats and Republicans from around the state who understand the need to move 911 forward,” said Sen. Cheryl Kagan, (D) District 17. “Next Generation 911” will allow residents to send texts, photos and videos to operators. A 2-year statewide commission was created last year to help roll out the new system. The commission also released a 65-page report that listed 23 recommendations on what upgrades the state could improve upon. Recommendations included technology upgrades, increase cybersecurity, and talk about the decreasing amount of operators. 13 percent of the state’s 911 Specialist positions are vacant. The current 911 network in the state is based on a design that is more than 50 years old. Funding will also have to change as the current 911 funding would not cover the cost. Officials said the initial cost could be between $40 to $50 million. “This is a challenge,” said Chief Richard Brooks, director of emergency services, Cecil County. “It is not insurmountable and it is for one purpose, and one purpose only and that is to protect the people of the state of Maryland and the visitors in this great state. According to Senator Kagan, 22 other states are ahead of Maryland in upgrading to this system. ANNAPOLIS — Which came first: the chicken, the egg or the flu? In the past decade, Maryland has seen a growth in niche poultry markets where chickens, ducks and turkeys are sometimes sold without record of their home farm. This has raised concern among animal health professionals, who are trying to protect the state’s avian influenza controls, which rely on sale records to quickly locate farms and eradicate sick flocks. “Birds are being mingled, and if they do get sick, we have a hard time tracing them back to the farm of origin,” State Veterinarian Michael Radebaugh said in an interview on Tuesday. A “devastating” outbreak of avian influenza hit poultry producers in 2004 on the Delmarva Peninsula, after a sick bird from a New York market was introduced to a commercial flock. The state’s current poultry regulations were drafted in 2005 to prevent a similar outbreak, and this session, the Maryland Department of Agriculture is asking the General Assembly to consider a rewrite that would expand the agency’s right to oversee the sale and transportation of poultry at emerging markets, including swap meets, flea markets, internet sales and poultry dealers. The Senate Education, Health and Environmental Affairs Committee heard the bill on Tuesday with little objection, but asked the department to clarify the licensing requirement for individuals who transport live birds. “So, I’m just a random truck driver — I don’t buy them, I don’t sell them, I don’t exchange it — I drive the chickens to another place. Do I really have to get a license for that?” Sen. Cheryl Kagan (D-District 17) hypothetically asked Radebaugh at the hearing. No, that is not the intent of the bill, he said. The intent is to target high-risk poultry dealers who may be picking up birds across state lines and driving them back into Maryland. The bill gives his agency, Animal Health, broader authority, but it also gives the secretary of agriculture the right to exempt certain people from the annual licensing requirements. That would likely include 4-H projects, fair sales or drivers such as the ones Kagan described. Overall, bill SB 56 is meant to improve the records kept on the sale and movement of poultry. Records are imperative because they reduce the amount of time it takes Animal Health to respond to positive or inconclusive avian influenza tests. Right now Animal Health is testing birds in southern Maryland after a duck was found during routine surveillance at an auction market to carry a strain of flu that was not pathogenic, but could easily morph into a strain that could be passed between birds, Radebaugh said. All subsequent tests have been negative and the farm of origin was identified. “The quicker you get to it, the better. It’s amazing how these birds get moved along,” Radebaugh said. The Maryland Farm Bureau supports the bill. “I haven’t heard of anyone that has a squabble with this,” said Colby Ferguson, director of government relations for the Maryland Farm Bureau. The committee is also considering two changes to the state’s agriculture article that would bring it up to date with legislation passed in previous sessions. The first is SB 58, which removes references to “agricultural districts.” Back in 2007, the Legislature removed the requirement that farmers who wanted to apply for farmland preservation had to first place their farm in an agricultural district. It then legally terminated most of the districts in 2012. Frederick County is one of the few counties to still recognize agricultural districts, because it also offers those landowners a property tax credit. About 4,200 acres of farmland in Frederick County are under an agricultural district agreement. Landowners that currently have a district agreement can remain in it, even if the bill passes, and continue to receive the tax credit, said Anne Bradley, the county’s land preservation coordinator. The committee had no questions or objections to the request at the hearing. The second change, in SB 57, also modifies language in the agriculture article to change the length of time counties have to spend their money allocated for farmland preservation from three to six years. The state farmland preservation program has been operating on a biennial application cycle, which made it hard for some jurisdictions to spend their money within the three-year window, Ferguson said. The House of Delegates passed a bill in the land use article in 2018 that extended the time frame, but it was not adjusted in the agriculture article, Ferguson said. The bill would write the same language that passed last year into the state’s agriculture article and eliminate contradictions that currently exist between the two sections. Michelle Cable, executive director of the state’s farmland preservation program, assured lawmakers that the bill was not asking for anything new. It is purely housekeeping to make the two sections match. But the fix overall may not be as desperately needed as it once was. The state farmland preservation program will be moving back to a single-year application cycles starting in 2019, and it is expected to remain that way for the foreseeable future, Cable said. The Maryland Farm Bureau has come out in support of both bills. to ask that you expeditiously initiate a bipartisan compromise that will reopen the federal government. salaries that they depend upon to meet their most basic needs. we’re asking that you do. all of those that we mutually serve. Senator William C. Smith, Jr.
On behalf of the residents of Rockville and Gaithersburg, we are writing to request that the Department of Transportation hold a public scoping meeting in District 17 regarding the proposed I-270 traffic relief project. The proposed project has generated widespread concern among residents of our district, who fear loss of homes and businesses, as well as degraded quality of life from additional traffic, noise, and air pollution. Many residents have already voiced their concerns as part of the official public process, but many others have not. This was, in part, because no public scoping meetings have been held to date in the 1-270 study area. Senator Kagan raised this specific point at the October 2018 Montgomery County ‘Road Show.’ At the meeting, you committed to holding at least one public meeting in Rockville. The Montgomery County House Delegation learned last week that the public scoping meetings will continue to be held into February 2019. As such, we ask that you fulfill your promise and hold a public meeting in Rockville in the near future. The City of Rockville stands ready to host the meeting at one of their facilities. We look forward to your prompt response to this time-sensitive matter. For more information, please contact Delegate Palakovich Carr’s office at julie.palakovichcarr@house.state.md.us.